Michigan hosts over 19,000 acres of blueberry farms and produces approximately 100 million pounds of berries annually, according to Michigan State University (MSU). The region is capable of growing more than 20 different blueberry varieties, but MSU ranks several specific types as the most popular because they thrive the best in the state's sandy soil. When planting a backyard blueberry bush, selecting a tried-and-true variety can help you maximize your home berry production. Bluecrop is one of the most widely grown blueberry cultivars in the state because of its high fruit production, according to MSU. The shrub reaches a height of approximately 5 feet. Elliptical, 3-inch-long green leaves cover the shrub and become dotted with pink-white flowers during blueberry season. These develop into light blue, 1/2-inch-wide fruit. The plant itself is drought resistant and does best in southern Michigan. The Elliott blueberry is a late season-producing shrub. Gardeners and farmers prize it for its fruit's longevity, making it prime for storage, according to MSU. The shrub grows to approximately 6 feet in height and 5 feet across. Glossy leaves and a profusion of pink, bell-shaped blossoms make it prime for ornamental purposes. The fruit measure 1/2 to an inch across and are very sweet, prime for jam- and jelly-making. The shrub grows best in southern Michigan. For the firmest fruit, many southern Michigan gardeners choose the Duke variety, according to MSU. The glossy-leaved shrub grows between 4 to 6 feet tall and sprouts white flowers that become open clusters of fruit, making access easy for hand-picking. The texture of the fruit is so firm that it's almost crisp, but has a slightly tart flavor. Gardeners have been growing the Jersey blueberry cultivar for decades and it was one of the main shrubs of Michigan's early blueberry farms, according to MSU. Farmers also prize this shrub because of its exceptionally hardy nature; it will thrive in almost any type of soil, though it does best in northern Michigan. The shrub grows 5 to 6 feet tall and the same length across, and sports dark green foliage with small white flowers. The berries themselves are 3/4 inch to 1 inch across and have a deep blue hue. 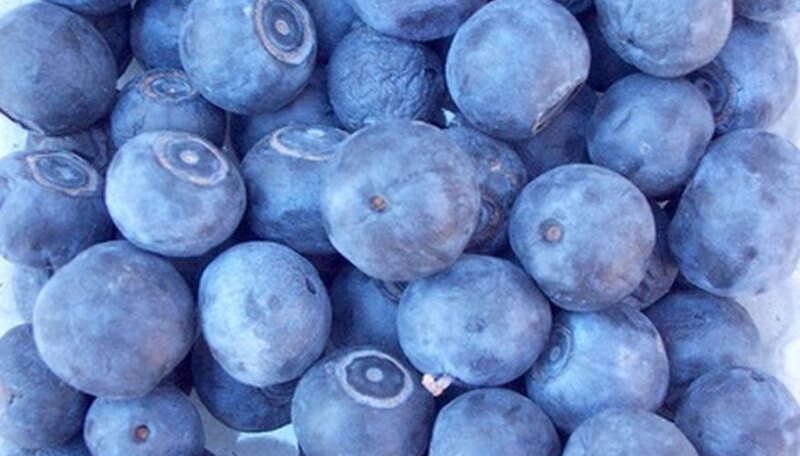 The Blueray variety has some of the highest quality fruit, according to MSU. It grows well in northern Michigan. The shrub grows higher than many cultivars, reaching a height of up to 8 feet. Medium blue berries measuring about 1/2 inch across appear mid-season among dark green oval leaves. The flowers themselves are waxy in texture and white in color.